Users have access to their projects categorized by attributes such as customer, geographical location, dates and many more. 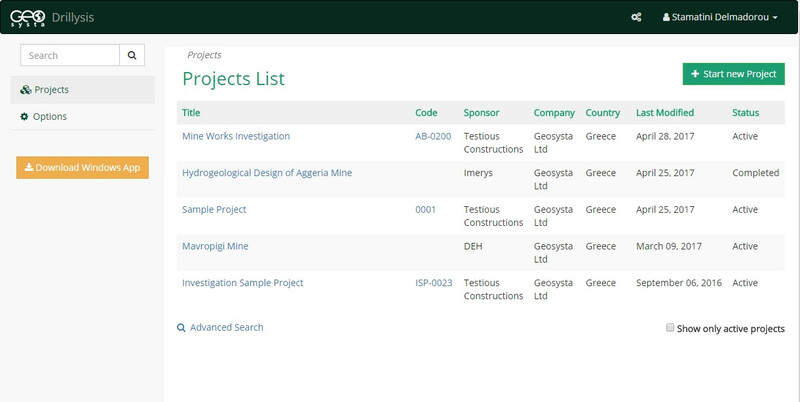 Stores all project information such as Drill rig, Drill Operator, Field Geologist, Dates of Drilling etc for different projects, different clients in a single database with search capabilities and easy sorting and viewing of information. Create your own borehole logging templates or use one of the predefined. Modify existing or new borehole logging templates even after you have stored information. Create copies of new or modified templates. Insert predefined information columns anywhere in your borehole logging, modify your column width, optimize your columns to fit your selected page layout, fast and easy, even after information has been included. Select your page layout and modify the depth per page, depth interval per page before, during or after you have included data. Hide columns or specific sections of columns without losing your entered data. Bring them back on just as easily. Include vertical photographs of your drilling cores with depth in the same scale with all other data, or include core box photographs in your borehole log. Insert core photographs vertical or horizontal very easily. Use predefined descriptions based on USCS or ISRM just with a click in predefined order which helps to consistently present your descriptions or insert some predefined and add anywhere your custom ones. Accompany your borehole logging descriptions with different colors and use the appropriate graphical symbolism from a large number of hatches. Insert in situ and laboratory test values for any type of test. If it is not predefined you can always define your own custom column. View your borehole logs as you prepare them in real time. Export your borehole logs in pdf or image form. Prepare borehole log reports in pdf or word files which include all the information stored in the database. You can select which information will be exported or which boreholes to be included in the reports. Use S.I. or Imperial units per project and change your unit system any time you like. Prepare borehole logs in one unit system and export them in any system needed.